Yesterday I did an event that wasn’t profitable, but still worth attending. This event is in a city centre to a lot of people down and out on their luck. That being said I heard story after story from people that had done it all, so they said, but one thing I noticed is that all of them blamed someone else for their bad luck. They all spoke okay, some had extreme knowledge, and all had the time to come and see what we were doing. They were also all out of work and just spent their days walking around. I realize many people don’t have control of their situations, but many do. In my mind unless you have some kind of handicap and even there is room for discussion then why not make the best of your life. 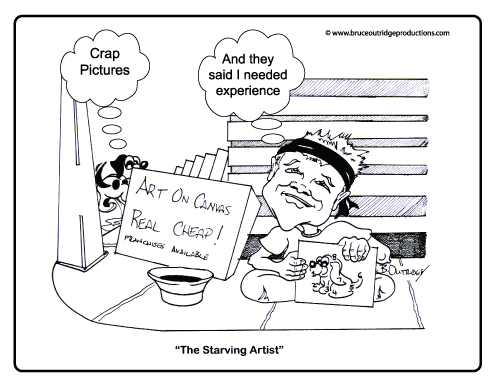 Don’t be like the starving artists, I am an artist and love food, starving isn’t in the cards. Make your life happen! Previous Post Previous post:Mash your art to make it work! Next Post If You’re an Entertainer, Play Your Part!